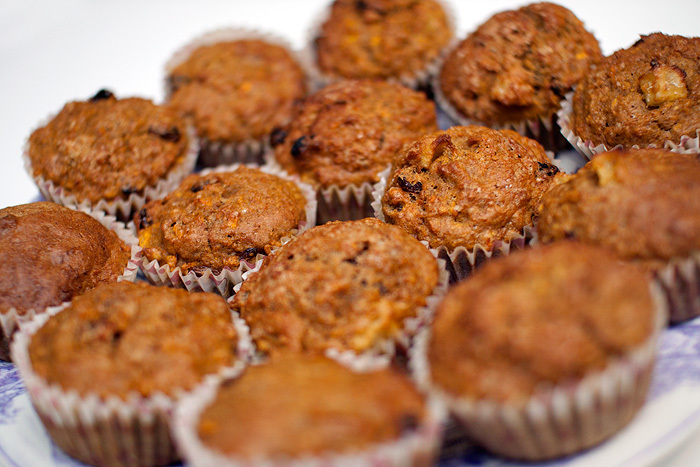 Carrot Cake Muffins, they’re very nearly healthy! I made these because Leila refuses all vegetables… I don’t see them as a viable, long-term way of increasing her veg count… I just get sick pleasures from knowing that she’s eating quarter of a carrot per muffin. And loving it. 1. Preheat oven to 170 degrees celsius and line a tin with paper muffin liners. 2. In a large bowl, sift together flour, baking powder, baking soda, salt and cinnamon. 3. In a separate bowl, combine the eggs, oil and brown sugar; beat well. Combine both wet and dry mixtures and mix briefly just to combine, don’t overmix. 4. Fold in the carrots (I had previously pulverised them in the food processor) and sultanas before spooning the mixture into the muffin cases. 5. Bake in a preheated oven for 20 to 30 minutes. You can ice/frost them if you want but this will obviously KILL the healthy stance! They’re not the sweetest treat but they’re filling and taste pretty much like carrot cake without the frosting. Leila eats one along with her yoghurt in the morning. Once cooled, I pop them in a tupperware box and store in the freezer. To defrost, I just take one out and zap it in the microwave for 30 seconds. Perfect! These would be great to take out of the freezer and pop in your work lunchbox too… defrosted by lunchtime and not horribly unhealthy – whoop! Apparently you can make brownies with sweet potato in them and they’re yummy and moist…not tried it myself yet though. That sounds interesting, I know you can do courgette… will have to research further! I never thought to blitz my carrots, I’m always there grating them for ten years and lets face it, one day I’ll just keep going and grate my knuckles off! You could always try putting fruit into jelly for her 5 a day? She hates Jelly! She eats fruit though without complaint… apples, bananas, pineapple, strawberries, blueberries (her fav)… doesn’t go much on mangos and melons though. You can tell I cling to her love for fruit, talk about variety! These look lovely! For more sneaky veg try the cookbook ‘Red Velvet & Chocolate Heartache’. Lots of gorgeous things to bake with very little butter and sugar and lots of veg for sweetness and moisture. The Birthday Cake, Banana Bread and Chocolate Brownies are particularly wonderful! My daughters, 2 and 4.5, love them and notice NO difference. Success! Also ‘Snog- Healthy Treats’ is good as uses agave syrup rather than sugar so no faffing about working out the substitution- this makes me very happy. Ok, those sound *really* good… Off to have a google, thank you! Ha! I love those “mum” tricks of hiding stuff you hate in other stuff you like, my lot never get a spag bol or shepherds pie without a ball or two of frozen spinach being lobbed in. That said have yet to find a way of hiding smoked haddock or apricots, both of which are universally loathed round these parts! Yum! My brother is having the same problem with my nephew so they started sneaking spinach into his grilled cheese sandwiches… seems to have worked! My mom says when we were young she used to chop up spinach, carrots, etc. very finely and put it into meatloaf. Possibility? Along similar lines, I’ve found that there are a few veggies that sneak into fruit smoothies very well! Squash, peas, carrots & sweet potatoes are pretty undetectable amongst some blueberries, strawberries, and some yogurt all blended up! Also, I made these veggie kugels for Passover last year and they went over swimmingly- they’re mostly apple, carrot & sweet potato (OK, some butter too, but there’s veg!) 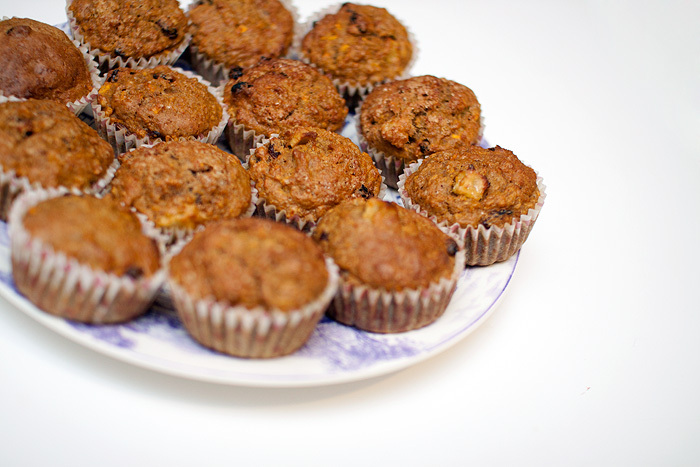 I like them because you can add sugar & cinnamon and make them sweet, similar to your carrot muffins, or leave it out & add a bit more salt for a savory version. Ah, the things we do for our kids! Boots £5 off No7 and Ruby & Millie starting today!